Bus Hire – You can hire 7, 12, 21 and 25 seater minibuses on a self drive basis. Alternatively, Cole’s Coaches have drivers that can drive your minibus. 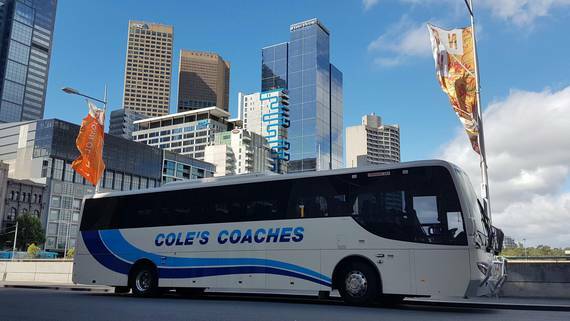 Our larger buses and coaches, for safety reasons can only be operated by Cole’s drivers. The larger buses and coaches range from 48 – 57 seaters. Go to “Our Fleet” to choose your bus or coach. Features are also listed. Thank you for the brilliant service. The coach drivers (Andrew & Warwick) were pure gentlemen. Thanks for adding to a very successful night and I will be recommending Cole’s Coaches to anyone in need of your services. We appreciated the care Brian took over getting us where we needed to go and helping with the pick ups and drop offs. For me it was a real pleasure to hand over the driving to someone else and have that all go so smoothly. Dear Denielle and the Cole’s Coaches team. Thank you for helping to make our wedding run smoothly. We appreciate your professionalism and service. Ailiche & Jordan. Our coach trip was excellent. Our driver David (Cole’s driver) was a great man, his care, safety, cooperation and engaging personality was part of the success of the day. Thank you for your organisation. I wanted to write a quick note to say thank you very much for your assistance with organising our wedding guest transportation on March 25th. From all reports the drivers were great and the guests were very happy with their ride. Tom and I made our way home on the Barwon Heads bus and even though there were a few guests who seemed to have enjoyed themselves a bit much, the driver was very personable and patient. Thank you once again for such an easy process.